This is a short article about one of Walt Kelly's most famous cartoon creations. Pogo was a wise and humorous sage of the Okefenokee Swamp in South Georgia. Pogo, a creation of American cartoonist Walt Kelly, was the leader of a group of fictitious swamp critters whose homeland was the great Okefenokee swamp of South Georgia. Pogo and his friends often had things to say about the politics and mannerisms of American life. He often left readers either tickled or intrigued. Drawing of a real opposum. Though in real life they are often not friendly, Pogo came across as very lovable. A friend to all, he would bring a smile to your face. I remember as a child digging through the local newspaper to find the comics section. There I would quickly skim through to find Pogo and his friends, often poling the skiff "Fort Mudge" through the moss hung trees of the Okefenokee and discussing the events of the time. I always enjoyed their commentary on life. They would often leave me smiling as I thought over their comments. I particularly remember one scene where Pogo and some friends are aghast at the piles of trash they have found floating in their wonderland. Pogo's comment became famous: "We have found the enemy, and he is us!" An American cartoonist by the name of Walt Kelly created the Pogo cartoon script. It was set in the Okefenokee Swamp and featured the loveable opossum, Pogo. He had a cast of other critters who helped him as he examined and philosophized about life. Some of Pogo's friends were Albert the Alligator, Howland Owl, a mud turtle known as Churchill "Churchy" La Femme, some variation of a hound dog named Beauregard Bugleboy and many, many others. The cartoon script ran from about 1948 to 1975. It is hilarious fun to read even today, if you can find it. You can find far more than you might really want to know about it by searching Wikipedia for "Pogo (the comic script)". Added note: I recently visited the Okefenokee Swamp Park near Waycross, Georgia. As we toured the park, we attended a wildlife show held in the theater of the snake house or what they call the “serpentarium”. After you exit the theater, you enter a small foyer where a very informative exhibit about Walt Kelly and his cartoon work is viewable. It is worth taking the time to browse through it. You will enjoy it. This link will take you to the website for the Okefenokee Swamp Park's Pogo page. 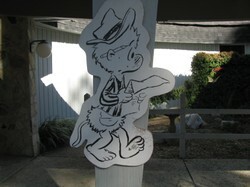 This link will take you to the Walt Kelly collection... cool stuff here! A look at The Far Side cartoon and its creator Gary Larson.